Imperfectly Painted: Sally Hansen Pacific Pee-Yew! It's not really Pacific Pee-Yew, it's Pacific Blue. The smell of this polish would definitely make be doubt it's real name. At first I thought it was just me, but I've read other reviews that this polish stinks! There is no way to put this politely, but this smells like fart. It's like someone farted into the Sally Hansen bottle put in some pretty blue polish as some cruel awful joke. It either smells like that or the smell you get when you drive over a dead skunk on road that's been sitting out in the sun for a few days. It's pretty awful, but the color of this polish is great! I think the color is worth the whiff of nastiness, but I can see why others would pass on this polish all together. Pacific Blue is a bright cornflower blue creme. I wouldn't really say this is "Pacific" blue, it doesn't remind me of the Pacific Ocean which I think is more of a deeper blue. I'm not picky about that or anything, just figured I'd mention that. I'd love this color if was called Meow Mix Brown. The name doesn't matter :P. The application of this was great. It went on smoothly in 2 coats. It's such a great creamy blue color. I like cremes, but I get bored with generic colors that you can find 2-10 dupes of, this is definitely different from that. 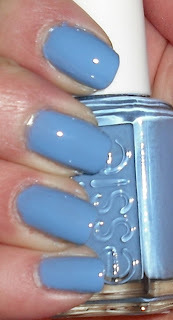 Speaking of dupes at first I thought this maybe a dupe for Essie Lapis of Luxury, but they are different. Lapis of Luxury is more of pastel light blue with a hint of purple, rather than the vibrant Pacific Blue. I love this color! It is definitely one of my favorites. My bottle of it doesn't stink though.. I guess I'm lucky! Haha this is the second blog to mention farts this week hahaha! Anyways too bad it smells bad the color is really pretty. It looks a little like Secret peri-wink-le from china glaze in the picture i think... maybe this is darker.. idk lol. I love it. haha! oh my goodness, I have this but only used it once quickly. Now I want to see how farty it really is. I love this colour. But I didn't remember it smelling bad, so I had to pull out the bottle and check. It's no different than any of the other Xtreme Wears I have. And no worse than other brands. I guess I got a lucky bottle. Now I have to sit and recover from my nail polish smelling. Btw, are you sure the polish is stil good? That smell is not normal ! My bottle of Celeb-City from this line smelled horrid too! Sounds like you found the garbage area of the Pacific? LOL IDK why that happens with the random lacquer? I've never experienced such a stench, but I do love the color! After reading your post, it almost makes me want to hunt down a bottle of that polish *just* to smell it. How annoying is it when somebody says "Ewww! This stinks! Smell it." LOL Great color, though. It's a pretty color, but ew...stinky nail polish. Did it continue to stink after drying?